Storage must-haves with style flair, this drawer dresser from the Rustic Lodge collection is sure to make a handsome addition in any master suite. Crafted from hardwood solids and veneers, this dresser features an Acacia finish that will warm any decor. 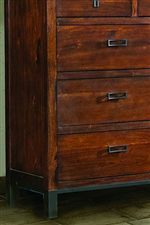 Combining rustic elements with a contemporary vibe and introducing an industrial tang, this dresser offers intriguing style that is sure to make a statement. Nine spacious drawers are supplied for you to fill with t-shirts, jeans, socks, and sweaters. Raised rectangular metal hardware and a metal straight leg base complete the dresser with distinction. Welcome fashion and function into your bedroom, with this nine-drawer dresser from Rustic Lodge. 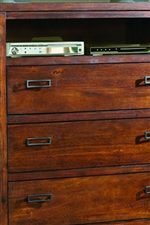 The Rustic Lodge Nine-Drawer Dresser with Contemporary Metal Base by Vaughan Furniture at AHFA in the area. Product availability may vary. Contact us for the most current availability on this product.